The world of shrubs is exploding with purple and bronze foliage choices. Weigela “Spilled Wine” is a low, mounding shrub with the potential to replace the “Crimson Pygmy” barberry as a landscape staple, and unlike the barberry it’s thornless. Weigelas like “Rainbow Sensation” and “Wine & Roses” have dark pink trumpet-shaped blooms that are magnets for hummingbirds. The barberry “Crimson Pygmy” is very popular, and its larger cousins “Cherry Bomb”, “Rosy Glow” and “Royal Burgundy” also have terrific maroon foliage. If you prefer a low, compact shape, “Concorde” is a good alternative to “Crimson Pygmy”. There is a new Barberry called “Golden Ruby”, a dwarf mounding plant with deep maroon leaves edged with gold. Another great new introduction is the ninebark “Little Devil”. Ninebarks with bronze foliage like “Diablo”, “Summer Wine” and “Coppertina” are spectacular shrubs, but too large for most foundation beds. “Little Devil” is just as stunning but more compact. For red winter color, red-twigged dogwood shrubs stand out neon-bright in the snow. The best red-foliaged trees are the Japanese Maples, both weeping and upright. We really like the “Emperor” tree form maple, and our favorite weeping dwarf specimen is “Tamukeyama”, which has deep maroon leaves that turn fire-engine red in fall. There are many crabapples with maroon foliage, and tiny fruits that birds gobble before they hit the ground. Standouts include “Purple Prince”, “Royal Raindrops” and “Indian Magic”. Our perennial garden is a showplace for purple-leaved plants like penstemon “Dark Towers”, with tall stalks of hummingbird-attracting lavender trumpet-shaped blooms. “Husker Red” penstemon is another good Penstemon variety. A great companion for it in the full sun garden is Sedum “Maestro”, with purple-tinged bluish-green leaves and dark purple stems. Perennial gardens with part shade are ideal for purple coral bells, like heuchera “Palace Purple” or the new “Frosted Violet”, which has delicate tracings of silver on leaves that are almost black-purple. The purple tracings on silvery Japanese painted ferns make a perfect contrast with purple heucheras, and grow well in the same shady conditions. 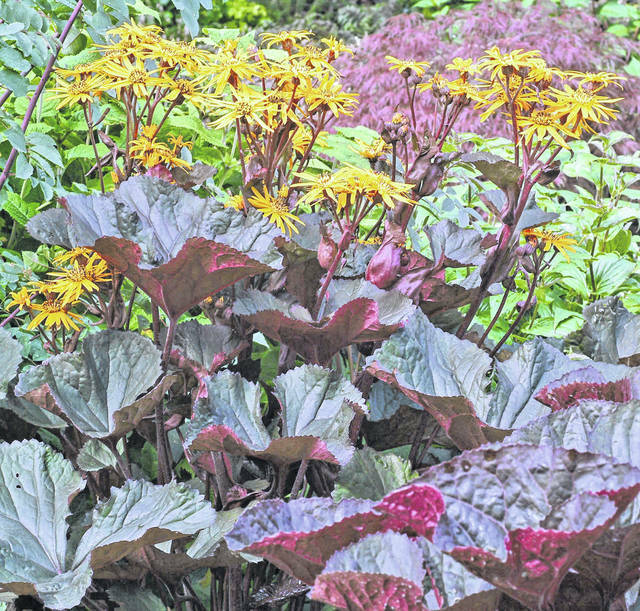 The exotic-looking ligularia “Britt-Marie Crawford” is another great purple plant for moist, shady spots. If you want a purple shade tree, the Norway maples “Crimson King” and “Royal Red” are virtually the same tree and both provide very dense shade. 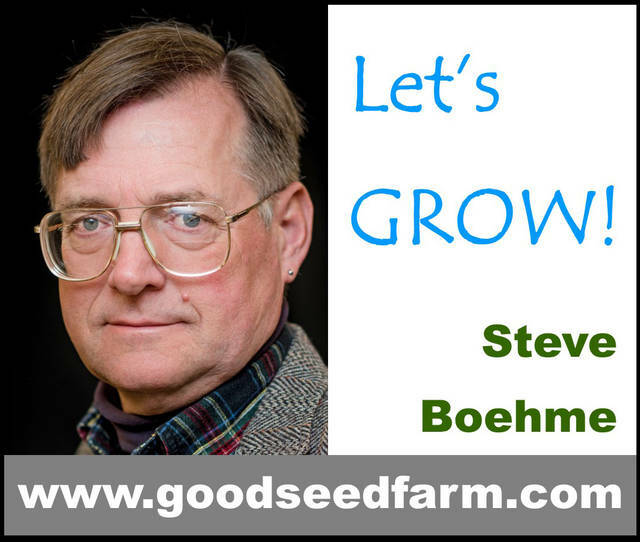 They grow very slowly, however, so you’ll have to be patient, because it takes many years for them to develop a large enough crown to give much shade. Annual bedding plant standouts include the ornamental sweet potato vine “Bright Ideas Black”, a new variety that resists fading and really fills out a hanging basket or container. It looks terrific hanging over walls, or combined with the original Wave Petunia with its dark purple centers. Another great purple-leaved annual is Persian Shield, an upright grower that makes a great centerpiece for planters. It has bold silver patterns on its purple leaves.